These are exactly as described. The price is right, they seem well made and are attractive. I'm considering getting more. Enjoy extra seating and the contemporary, chic design of this set of two counter-height stools. At 24 inches tall, these sturdy steel stools showcase a powder-coated antique cream white finish making them a refreshing and brightening addition to your kitchen. Ordered these stools for our kitchen island and love them! Counter height stools are perfect height. Color is closer to cream than white, but fit in perfectly with my decor. Definitely order if you are on the fence! Incredible value for the price. Well made & sturdy design, easy to stack, nice enamel white finish, rubber foot protectors a plus for hardwood floors. 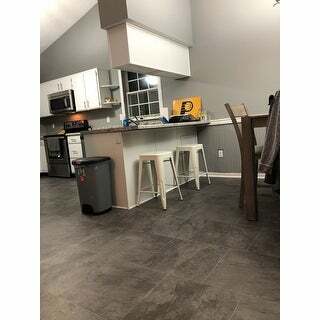 I ordered the metallic finish first and liked the look but thought white would go better with my kitchen so returned the metallic and ordered the white. We are in the midst of a house renovation and needed some kitchen stools for extra seating and for interim kitchen island seating while the house is in progress. 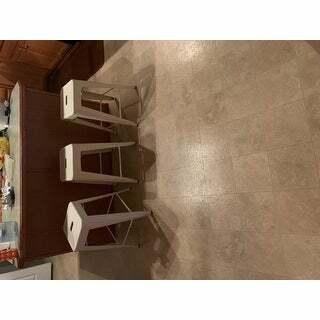 These stools have come in very handy, look great with my kitchen (white cabinets, blue granite and stainless appliances). I will likely be ordering 4 more as these stools are comfortable, easy to store and make great extra seating for impromptu guests. This was my first purchase on Overstock.com and I am a happy OS customer. OS service was great and return of first set of stools was very easy. Delivery was very fast both times. These stools are very sturdy and nice. My only issue is they're about two inches two tall for my short legs. These appeared more cream than white in the picture. I was hoping so and that was the case when they arrived! Perfect for my kitchen! For metal stools, these are actually comfortable! They look great in my kitchen. Easy to clean. No complaints! I was worried about getting stools without backs for my 4 rowdy boys. These have been amazing. They fall off these way less than the backed chairs at our bar. They are so easy to clean, move around easily, come with soft bottoms on them already. I've been very happy with them and with the overstock service. It was my first time buying on here and I'll be back. These stools are really nice. The white color is a little more "antique" or cottage white than I needed, but I'm still happy with the quality and price and will use them as extra chairs since they stack. I have a set of 2 stools which look great at the end of my kitchen island. They are a nice shiny white (true white). They can be stacked which is very handy when you want them out of the way. Not that comfortable if sitting for a long time (which is to be expected since they are metal) but for breakfast they are great. I am really impressed with these stools. The color is a nice off-white color. Not too yellow and not blinding white. The finish is very smooth and wipes clean easily. My only complaint is that the seat part is a bit small for adults. They work great for my small children, which was why I bought them. Also, the handle opening in the middle makes them super easy to move around. 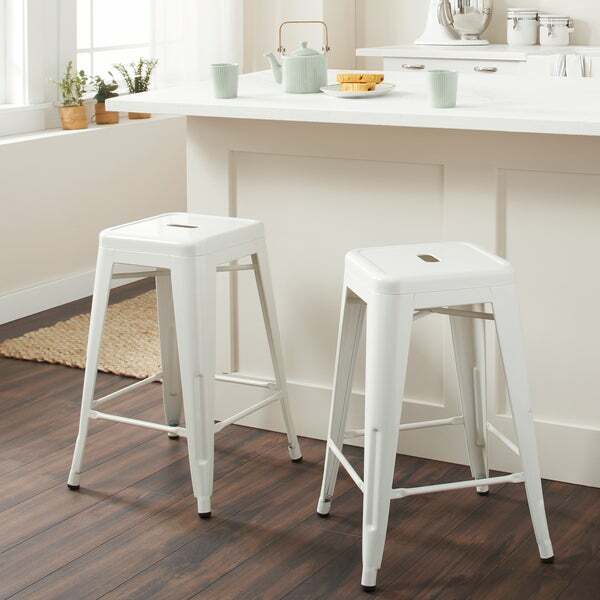 I ordered these stools to accompany a white counter-height table in my kitchen. They are perfect for my needs in every way. They arrived assembled (yay) and feel very sturdy. I am able to push them under the table when not in use, which saves space. The finish is glossy and the color is a pretty true white (I would not call them cream, as some reviews say - they are definitely whiter than antique white/ivory, etc - milk white maybe?). Great value for a quality stool. Get some! 3 little kids, 2 dogs, hardwood floors. These are holding up great. Easy to wipe down, don't scratch the floor. Bought these for an Ikea counter. They match the white top perfectly. Well made with rubber feet to prevent slippage. Very happy with them, especially at the price point from Overstock. Love love love them. They are exactly what I wanted. Heavy duty and easy to move around. These stools worked out perfect for our kitchen! Very sturdy. Very nice chairs thank you. The quality is excellent it goes with my decor love em lots. Thank you very much overstock!! Loved these stools so much I bought two more! With two kids under 3 I was looking for something stylish for our kitchen island but also low maintenance. I love that these can be wiped clean of any spills. We have had our first set for two years and they look brand new! Very pleased with this stoops. Easy to move around, no nicks on floor. Very easy to wipe clean. Perfect height for my 3 year old to climb up on. These are a perfect compliment to the similar Tabouret stools that have the back. We have two backless and two with backs so that we can use our kitchen island as more of a table and they go perfectly. They are sturdy and look great. I was looking for the perfect farmhouse looking stools and these are great. They have took quite a beating and still look amazingly good. The paint has held up perfect,no chips. Love the simplicity of these barstools. They are perfect for our beach house, low maintenance and streamline. We have had them for a couple of years with no complaints! Great price, thanks Overstock. "Can you please tell me if you can stack these when not in use?" Yes, they can be stacked. "I see the seat base is 12x12; can you tell me the dimensions of the base/feet - is that 16x16 on the floor?" Yes, the base measures 16 x 16. You are correct. The foot step bars are set 15 inches apart while the base/feet from outside end to outside are set 16 inches x 16 inches. "So are they true white or off white. Reviews are giving different answers." They are off white. More of a creamy white, not as bright white as my quartz counters. The stools are a true white. The picture is accurate, I looked at them in the warehouse, the seat isn't as shiny as the sides. "Can I use outside and do they come in 30 inches tall in white"
It is not recommended to leave these stools outside. Eventually they will rust. And yes, they come in a 30" bar height. "Can you tell me the actual weight of these stools?" The shipping weight of the set is 22 pounds. Each stool weighs a little over 9 lbs. "Are these stools matte or shiny white?" "The tentative date of delivery is not good for me.....how can I change the date of delivery?" Call overstock immediately or if you have a tracking number, call UPS or Fedex to rearrange delivery date or leave with someone else.